FOZZY Debuts New Video For Latest Single "Burn Me Out"
With the band currently headlining shows throughout Europe, FOZZY have just released the latest single and video for "Burn Me Out". The track was the fifth most added song at active rock radio on the first day of release with the video (a live performance clip that shows the band rocking a jam-packed house party) garnering more than 30K views on its first day. "Burn Me Out" marks the third focus track from FOZZY's October 2017 album Judas--the band's seventh studio album--released via Century Media Records. The previous Judas releases "Painless" and the album's title track were both top 10 Active Rock hits. ""Burn Me Out" is a sledgehammer riff and a million dollar chorus hook, that married the biggest jump groove since KOOL AND THE GANG's "Jungle Boogie"," Rich Ward (guitars, vocals) says of the track. "It quickly became one of the highlights of our live set and a fan favorite on our 2018 tour, so "Burn Me Out" was the obvious choice as our next video and focus track. Adopting the theme, 'There ain't no party like a FOZZY house party,' we have captured the essence of "Burn Me Out" and who we are as a band." Chris Jericho (vocals) adds, "4 out of 5 dentists have clarified that "Burn Me Out" is THE song of the summer (and the one that didn't likes Justin Bieber, so who cares what he thinks) and this video illustrates that! High energy, filled with multiple hooks and hot chicks...it's the ultimate House Party and we aren't talking about KID N PLAY!" Watch the "Burn Me Out" video on KNAC.COM right HERE. 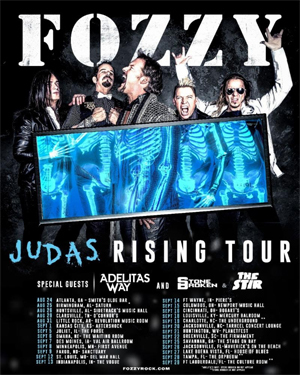 On the live performance front, after the European shows, FOZZY will resume their headlining North American "Judas Rising Tour" this summer and fall with ADELITAS WAY, STONE BROKEN and THE STIR supporting. The dates kick off August 24 in Atlanta, GA and will hit major markets like Minneapolis, Cincinnati and St. Louis along the way (see full itinerary below). Tickets for this leg of the "Judas Rising Tour" are on sale now; click HERE for tickets. FOZZY's headlining tour kicked off in May 2017 with sold-out shows across North America and Europe. Following the North American shows, FOZZY will head to Australia in early November before closing out the month in Canada for shows with THREE DAYS GRACE and NOTHING MORE.